I just worked Iraq for the first time. YI1RZ on 20m using JT9-1 mode. What was remarkable about this QSO is that I worked YI1RZ despite the presence of heavy RTTY QRM. My Elecraft K3 has great filtering but it can do nothing about a RTTY signal that is straddling the QSO frequency. Why, in this age of DSP, do people persist in using this antiquated mode? Dating from the 1930s and the age of mechanical teleprinters and analog modems, RTTY is by any definition an outmoded mode. It requires far too much power and occupies far too much bandwidth for the data transmission rate (45 baud.) PSK31 has existed for more than a decade and is a far more efficient mode. If PSK31 is too slow then there is PSK63 which is faster than RTTY and yet still manages to occupy less bandwidth. Not to mention the plethora of other modes such as MFSK and Olivia that have been invented in the last 10 years offering far greater reliability than RTTY and, like PSK, the ability to use the entire character set not just capital letters, numbers and a few punctuation symbols. And which don't print up garbage because a shift character wasn't decoded. It feels good to get that off my chest! I'd better put my asbestos suit on! It is interesting to note that as I have been typing this WSJT-X has been pulling JT9-1 out of the air in the teeth of RTTY interference so great that you cannot even see the JT9-1 signal traces. JT9 rocks! I doubt if the RTTY operators even know the JT9-1 signals are there. Glad you feel better now Julian. Better get rid of those old modes - SSB, CW and AM while you are at it. Dam their inefficiency and their need for old fashioned moving coil loudspeakers! The trouble with these JT whatever modes is that they are invisible and inaudible. I used to operate electro-mechanical RTTY (Ah! the smell, the NOISE the reams of paper on the floor - who needs a log book when you can keep clippings of your QSOs in a scrapbook) and I doubt the vast majority of today's RTTY ops have ever heard of a teleprinter or how it operates. All these "599 73 GD DX" macros and no keyboard skills. It's just another clickity-click mouse driven digimode (albeit a W-I-D-E one in your opinion) to most operators - no sense of history I would imagine. Therefore I'm not too keen on modern RTTY for reasons other than yours. But I still like to, you know, actually operate radio equipment and hear the signal rather than let my computer "communicate" with another computer (Too much of that in my day job thank you very much). But, each to their own and more power to yours. P.S. If I every get back on HF RTTY I promise to keep by diddles to the RTTY section. Look, there's nothing wrong with keeping historical anachronisms alive. But the mainstream of ham radio should be trying to innovate, not preserve. Nice catch Julian. JT9 rulez! Agreed. Good RTTance to RTTY. I thought someone might bring that up! But nobody has yet devised a better CW (digital mode that can be copied in the head.) No one has come up with a better voice mode than SSB either (DV may get there in the end but it's a long way off yet.) But there are many better data modes than RTTY. I agrre that rtty is a bit outdated but 1000% I agree with YO-WFF that we have to keep bandplan. You couldn't believe. I like RTTY. I like how it sound and how it work. I don't like how many peoples make it unsounding. It suffers as any other mode by the lack of patience being operated as any other thing today. CLANK & CLUNK, like the one arm bandit, insert coin. I think the same as you for RTTY for phone and that ancient digital fuzzy mode, CW if I recall. I known and I have used JT modes since then, you know. BTW I preferred a lot WSPR, whispering was on of my preferred. It may be that something was inoculated to me during one of first jobs ... it was around ASR TeleTypes, at DEC.
Not so easy to get real typewriters today, but if anybody see me on air please ask for a real operator to operator QSO. I will do my best, for sure. It doesn't seems to me a problem of modes, but just a problem of habits. It's not a problem of the mode anybody is using the problem is how it is used by somebody. And we are, BTW, in a whole open world. Does anybody remember what happened whit ROS? Compliment for IRAQ! Not so easy with the whole EU in between. ROS is very much alive and groing, despite of intense RTTY QRM. You Sir, forgot that RTTY uses tones of power, irritating a lots of people. ROS and psks, fsks, Olivia, etc are for use of low power. 30 to 60 watts, tops. Thats what you need, no more. But the problem of some men, is about power. They always want more and more. In everything. Waist of intellect, most of the times. High power should be banish because of some rednecks love to fry everybody with RF. Lots of studies have been made but even today i am still not sure if high power would be dangerous to people. "A King as is time, and them it dies." Julian, indeed flame suit on. Discussions like this always seem ignite a bit of controversy and that is not always a bad thing. I have a fondness for RTTY going back many years having been weened on the Model 15 Teletype. As someone already described, the sight, sound, feel, and smell. I think however that the real issue of discussion is the method of modulation rather than mode. After all, in essence PSK31 and RTTY are the same thing - a keyboard to keyboard or rather mechanical teleprinter to mechanical teleprinter mode whether the "mechanical" is brass and steel or silicon and video display. The difference however is in the way information is modulated and in that simple dual Frequency Shift Keying (FSK) of 170hz (or more) is not nearly as efficient as PSK or other narrow band modes. I am surprised that over the years those RTTY enthusiats didn't actively explore more narrow band techniques such as MSK particularly with the advent of inexpensive computer DSP techniques. And QRP RTTY does work and does work well. 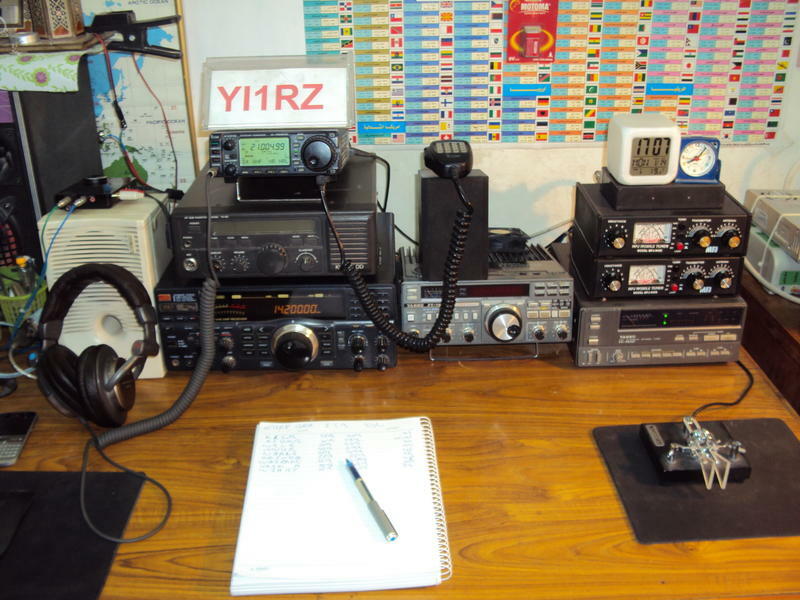 I have played in many RTTY contests RTTY and have had good success - it is not a mode where you NEED lots of Power, only those who are short of vision and narrow of thought feel the need for RF power.
" only those who are short of vision and narrow of thought feel the need for RF power "
Nice one, Julian. I don't think I've ever heard a YI! I have a soft spot for RTTY and use it in contests quite a bit, but I can't think of any sensible reason why I do. I can read it, even though I may be off tune which is more than I can with most of the other digital modes. It runs at a decent speed but not too fast for my one-finger typing. Its sound character changes, almost with distance ie I can tell a W6 or W7 from its slightly warbly note and in extreme cases, a ringing which persists after the transmission has finished. Mind you, I can be fooled: last Sunday evening, almost everything on 40m and 80m was ringing because of the aurora. Some G stations were all but unreadable! Keep up the good work. Yours is the blog I always turn to first. Who says it can't be done?